Congratulations to Andy English from Orostream Airconditioning Ltd who is our March Prize Draw Winner! We're pleased to announce the winner of our March Prize Draw is Andy English from Orostream Airconditioning Ltd.
Andy was happy to win a Makita LXT (DK1493WX) 10.8V Li-ion 2-Piece Kit with Combi Drill and Impact Driver. The Makita DK1493WX kit contains white models of the HP330 Cordless Combi Drill and the TD090 Cordless Impact Driver. Both are compact and lightweight making them the perfect tool for many jobs. The kit also includes 2 x 1.3Ah batteries, charger and carry bag. Check out our range of Power Tools. Look out for our Prize Draw entry cards when you next visit the Trade Counter! As our new prize draw for another great bundle is now open. 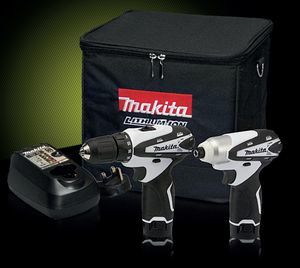 The bundle includes a Makita LXT (DHR 458Z) 18v Heavy Duty Combi Drill, Battery, Charger and Carry Case.